It's time to get corrected on the world's first 14 looping rollercoaster. Smile. Always. 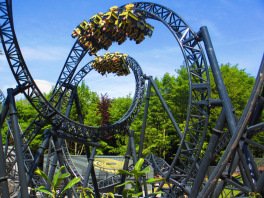 The Smiler is the next roller coaster to be built at Alton Towers, set to open this year. With 14 inversions, it will break the record for the number of inversions on a rollercoaster. Codenamed Secret Weapon 7 or SW7, it follows in the footsteps of other major rides such as Nemesis (SW3), Oblivion (SW4), Air (SW5) and Th13teen (SW6). The ride is being constructed in the X-Sector, on the site formerly home to the legendary Black Hole. It is the last ride that John Wardley will be involved in the design process.